Mali’s President Keita takes oath of office for second term – Royal Times of Nigeria. 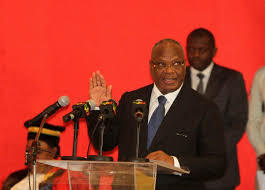 Mali’s President Ibrahim Boubacar Keita has been sworn into Office for a second five-year term. Keita took his oath before Supreme Court judge Nouhoum Tapily during a small ceremony held at the cultural palace in the capital Bamako today. In a televised inaugural speech after the ceremony, Keita pledged to foster national unity in the conflict-torn West African nation, where separatist rebel groups and Islamist militants stage regular attacks. The president also promised “a fierce fight against corruption’’ as well as job creation for young Malians. A public inauguration ceremony is scheduled for the twenty-second of September, at Bamako’s football stadium. Keita was re-elected amid a tense presidential run-off in August, which was disrupted by sporadic violence. The seventy-three-year-old received sixty-seven-point-one-seven percent of votes, while his arch-rival Soumaila Cisse took thirty-two-point-eight-three per cent.